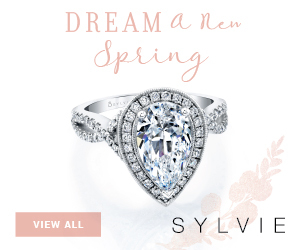 Your engagement ring: first you covet it, and then you need to care for and clean it. 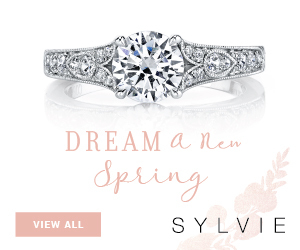 Bridal jewelry expert Sylvie Levine, designer of her namesake Sylvie Collection, offers her best advice for having and holding on to a beautiful and sparkly engagement ring! 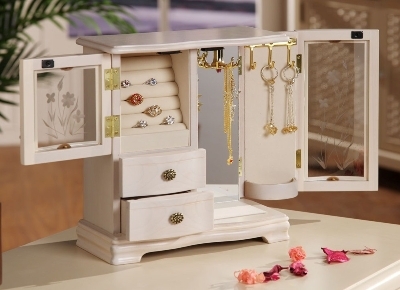 1 – STORAGE: When you take off your jewelry, be sure to store it in a safe place where you ALWAYS put it. Cute ring dishes readily sold on the market can be placed on bedside tables or dressers. 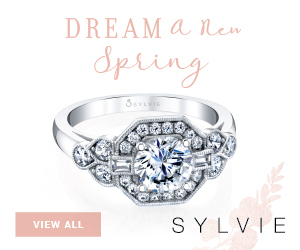 Or, invest in a safe- best for those who don’t wear their engagement ring every day. Place the key on your home and car keychain for safe-keeping. 2 – SECURITY: Have ring prongs checked every six months to be sure your diamonds (or colored gemstone/s) are secure. Stones can become loose with usual wear and tear. While there, ask for your ring to be cleaned and polished. 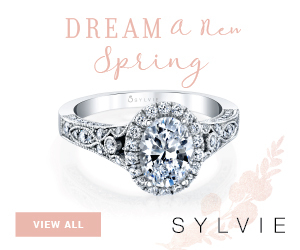 Your reputable jeweler will be happy to oblige. If you don’t have a reputable jeweler, visit Jewelers of America’s website (www.jewelers.org) to find one in your area! 3 – JET-SETTING: Some experts recommend leaving jewelry at home when vacationing. I say, wear it and enjoy it! Commit to wearing your ring at all times while in foreign places so nothing is left unattended in hotel rooms. Check ahead of time to be sure your hotel offers an in-room safe. The best way to travel with jewelry that you are not immediately wearing is to place it in plastic baggies. Tuck baggies into a zippered compartment in your bag and don’t forget the jewelry is there! 4 – SPORTS: If you are a gym rat, opt to leave your jewelry at home. Gripping weights can dent the precious metal on your ring and even can compromise the integrity of your diamond setting. For swimmers, prolonged exposure to chlorine can damage colored gemstones. Sweat won’t permanently harm your jewelry but it can certainly dull the luster of the band and make diamonds appear less sparkly. 5 – INSURANCE: The most important safely precaution with regard to jewelry is to insure it! Jewelry is meant not only treasured but worn! There are several reputable personal jewelry insurance companies who have policies we can happily recommend including Jewelers Mutual ( www.jewelersmutual.com). 6 – APPRAISALS: Jewelry appraisals are important in the case of loss, damage or theft and will be required when you take out an insurance policy. If you have not had your jewelry appraised (or it has been a while), we recommend doing so. The price of gold has been on a steady incline over the past several years which will affect how much you are reimbursed in the case that you need to make a claim. 7 – COMPARTMENTS: Regardless of where and when you wear your jewelry, be sure to clean it and store it in a clean, dry place where each piece has a separate compartment. Diamonds are the hardest gemstone but they can scratch other gems and precious metals if piled on top of one another. 8 – SOAP, LOTIONS, POTIONS: Remove all gold jewelry before showering. Soap can cause a film to form on jewelry making it appear dull and dingy. Body lotions and oils can easily become lodged in prongs and behind gemstones and diamonds. Spray perfume BEFORE you put on your jewelry. By preventing the formation of this film, you immediately reduce the frequency with which your pieces will need to be cleaned. 9 – GREASE: Remove jewelry before cooking. 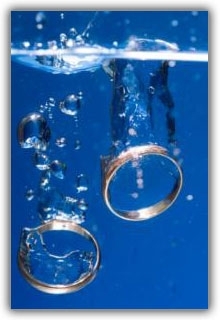 Grease can be removed from karat gold jewelry by dipping the jewelry into plain rubbing alcohol. Again, check with your jeweler about colored gemstone pieces. 10 – CLEANERS: In order to properly show off your diamond engagement ring, be sure to clean it often. I find the easiest and most cost effective way to clean jewelry is to use warm soapy water and a soft-bristle toothbrush. Drop the ring into a warm soapy mix and let it sit for 5-10 minutes. Use the toothbrush to scrub debris loose. Be sure to brush underneath and on the sides of the ring. When done, wrap your ring in a dry paper towel and shake. Unwrap and voila, sparkly jewelry! 11 – ULTRASONIC CLEANERS: Be extra careful with ultrasonic cleaners which can make loose diamonds looser. Some ultrasonic solutions not safe for certain colored gemstones. If you have a diamond engagement ring, most at-home ultra-sonic cleaners are in fact safe but be sure to check with your reputable jeweler to see if the model and solution you are using is ideal.